Best of all, The Weekly Fundraising Round-Up is 100% free, and we never spam, rent or sell our list. You may unsubscribe at any time. 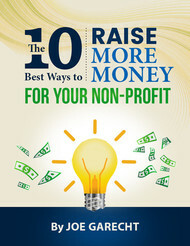 When you subscribe to The Weekly Fundraising Round-Up newsletter, you’ll also receive a free copy of Joe Garecht’s new e-book The 10 Best Ways to Raise More Money for Your Non-Profit. This guide will give you ten actionable ways you can strengthen your development program and raise more money for your organization, starting today. This special report is only for subscribers to The Weekly Fundraising Round-Up.